Where two greats collide: Rainforest meets Reef | "MASTERS"
Posted on January 24, 2016 by Mark and Sarah - MASTERS! MARK: We’ll never forget that knock on the door. It was the news we’d been dreading. “I’ve seen your missing cat poster in the newsagent’s window… I buried him”. The old man, dressed in a brown jacket which had seen better days, took off his cap as a mark of respect and bowed his head. Rushdie (after Salman Rushdie) our ginger (rusty coloured) RSPCA rescue cat was now no more. It was a CATastrophe for me and Sarah. Our little cat, who’d been such a part of our lives since we lived in York, had been mown down on the backstreets of Stotfold, Beds’ by a hit and run driver. We PAWsed and said a short prayer. Interestingly, exactly nine months later, ginger haired Joseph Michael Bailey was born in the Lister Hospital Stevenage. Rushdie had been reincarnated and was now a 6lb 13oz baby that pooped everywhere. They were one and the same creation, that there is no doubt. I suppose that really was the end of our animal magic period. And in truth, neither of us since have ever been fond of cats, dogs or any wildlife for that matter – sorry Janet, Stacy and all animal lovers that we know…. But hang on a minute, perhaps all that is changing. Could it be that Australia has been the catalyst for a Dr. Doolittle type transformation in our joint outlook? Well possibly yes, as we have amazingly encountered all sorts of two, four and “no” legged creatures during the past four weeks. 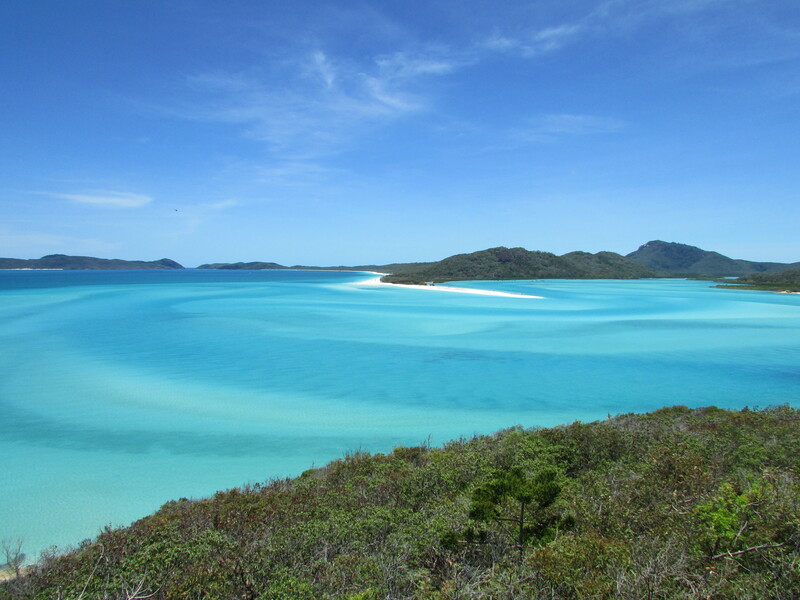 Plus, if you couple this with the beautiful natural world which uniquely collides as the Tropical Rainforest of Northern Queensland, joins the majesty and wonder that is the Great Barrier Reef. Yes I think we are now new fans of David Attenborough and Jacques Cousteau! 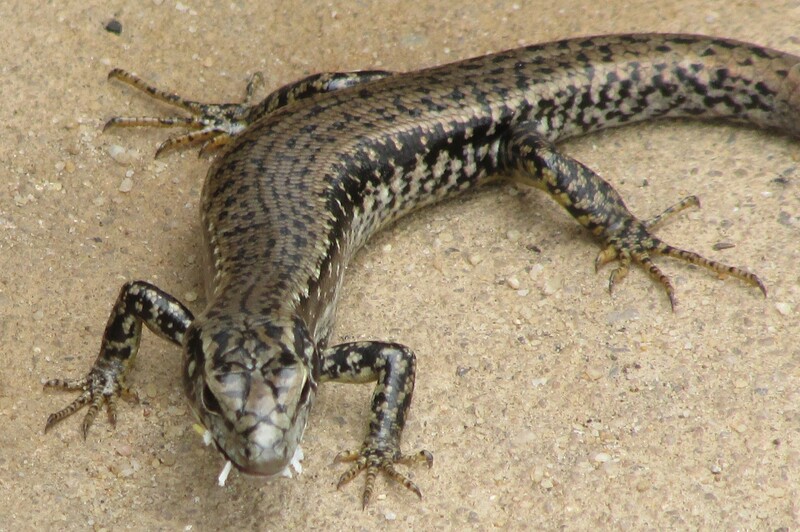 Our animal epiphany started with a lizard, Eddie my nephew’s lizard. They’re not creatures that you regularly come in contact with whilst driving on the M3 southbound at Junction 4. But in addition to Eddie’s mate, we have also fed a small one bread in the wild open spaces of the Blue Mountains (not sure we should have done that) and have been startled by one in a forest where to our surprise they are quite common. 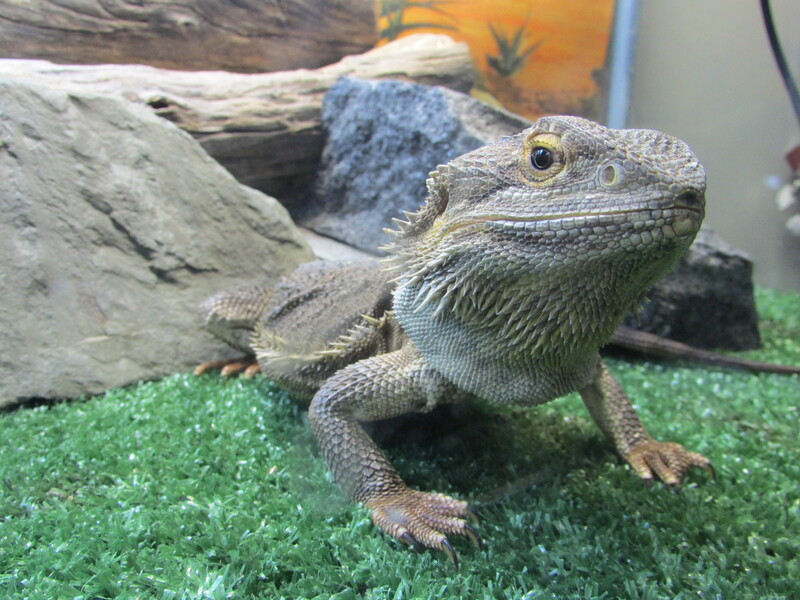 Arthur, Eddie’s pet – hope you are ok mate?? 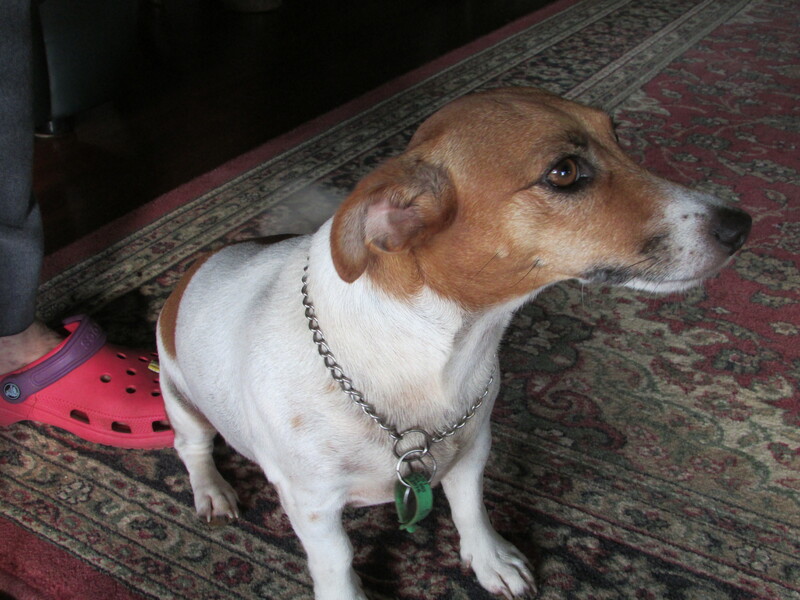 We’ve also had a number of “Skippy” moments. “Skippy” as in typical Australian animals that I remember from black and white TV days. 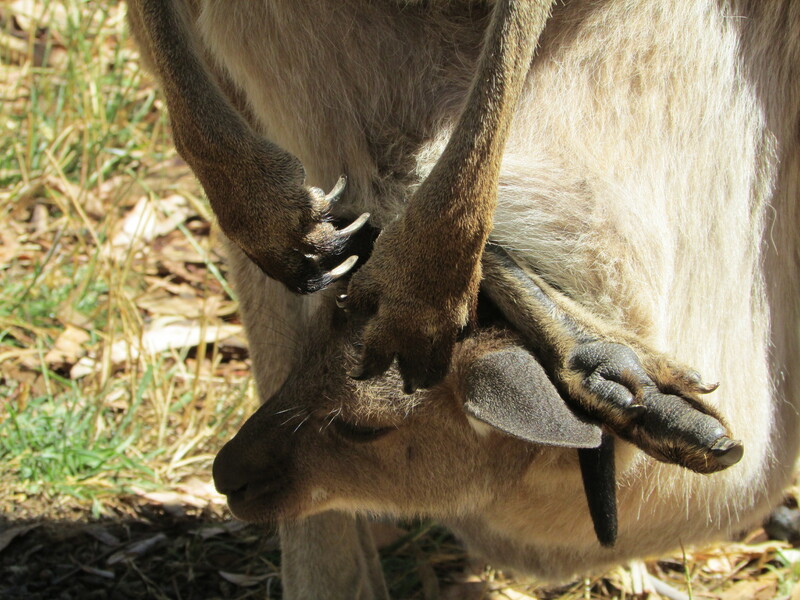 Question, I digress, but can you do that “tut-tutting” sound like Skippy the Bush Kangaroo? If you can, chances are you are 50+! Happy 56th Birthday Sarah by the way (27/01/60). Sorry, back on message now. 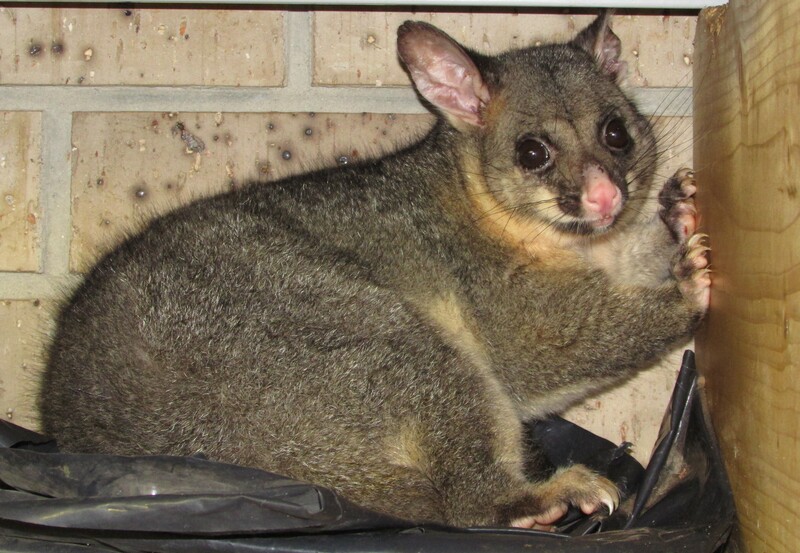 We met a possum, one of three who lived in Shane’s garage, loved seeing the baby ‘Joey’ close up and had a real fun moment chasing over 100 wallabies around an open area designated as a new housing estate in Mission Beach. Boy, did those things move quickly. Out of breath trying to catch this lot! But it’s not just the exotic (to us) animals and birds that have caught our eyes. 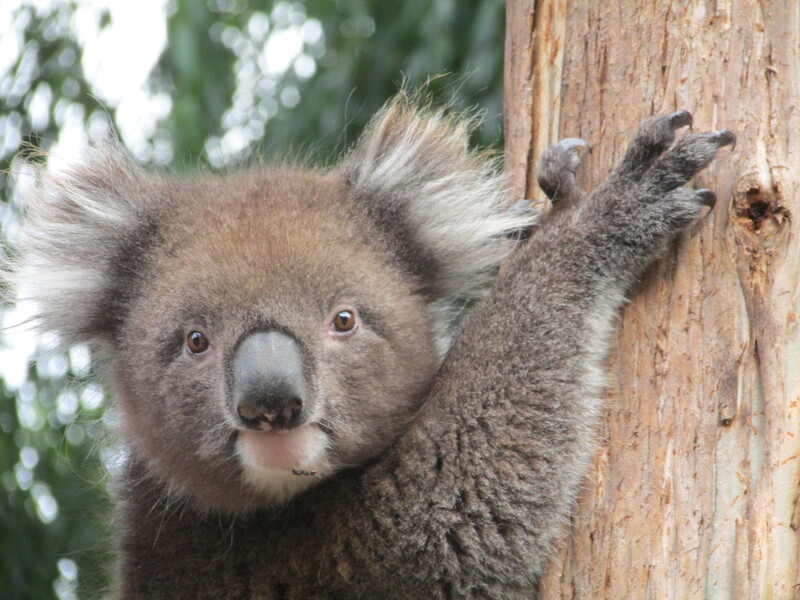 It’s the everyday creatures which WE have never seen before and which Aussies just take for granted. Take the little blue bird that hopped around us like a playful Robin. Not sure of his name – Chris Towers can you let us know? 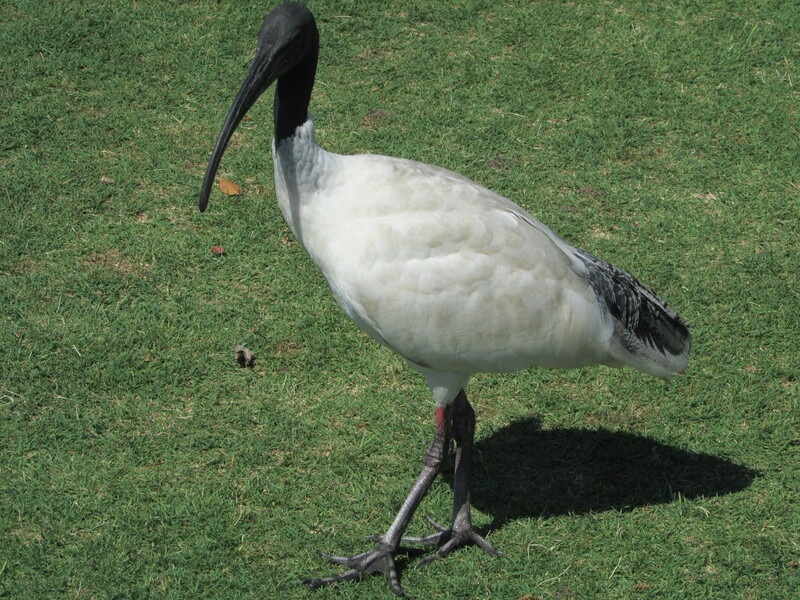 Then there is the national bird the Ibis, which you find everywhere. 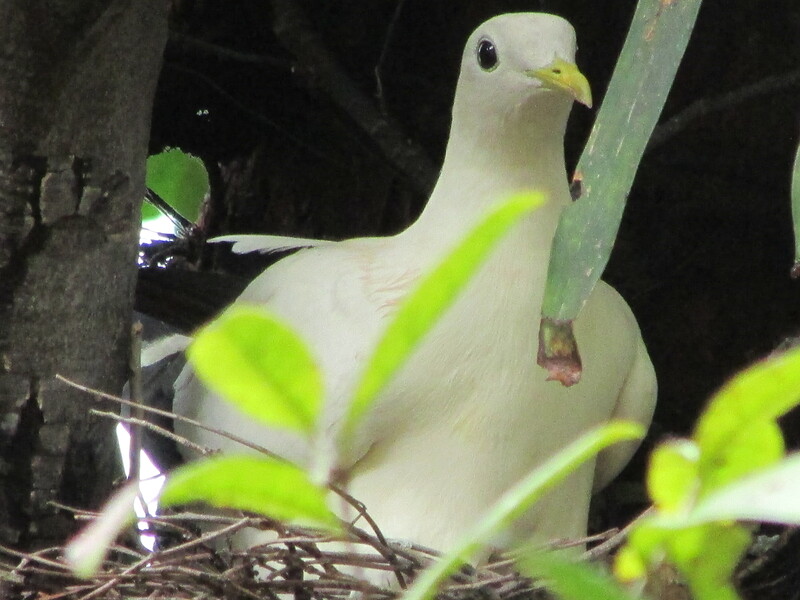 Pigeons are pretty special too, especially the pure white ones. Even the bees look brighter and more interesting than the ones in the UK. 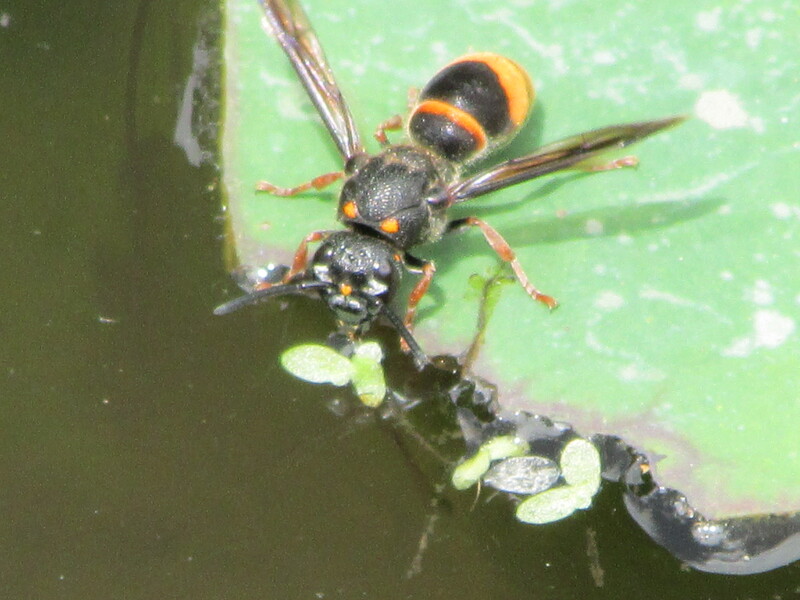 Not sure of his name…. can you let us know Chris T? 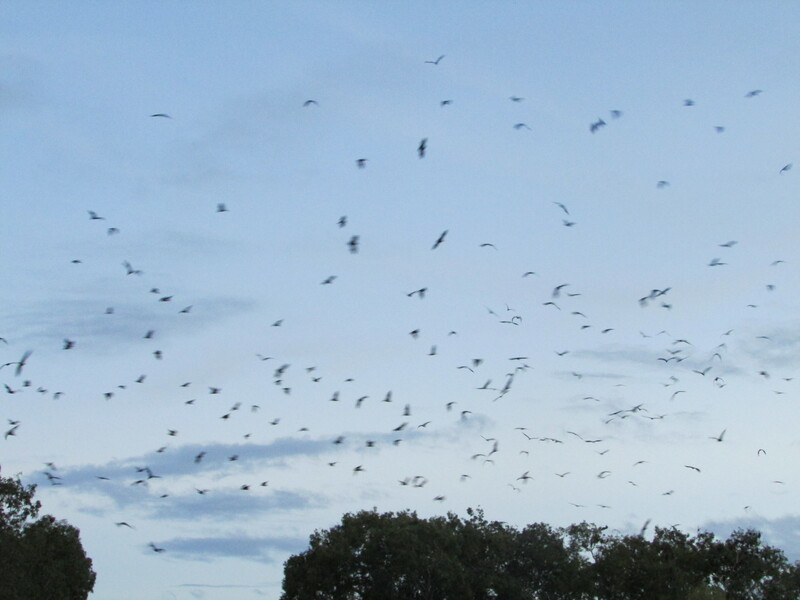 But it wasn’t a bird, but a bat – ney thousands of bats, which had us gawping in amazement. We’d been told by the skipper of the boat we went out to the Low Islands on, that there was one of the biggest colonies of Fox Bats in Australia, just around the block from the marina. He said go there at 1900 as seeing them take off was quite amazing. He wasn’t’ wrong. Bang on 1900, the sky was blackened as wave after wave of Fox Bats, decided not to hang upside down anymore on their eucalyptus tree branches, but instead head off to the Rain Forest some 15kms away for their evening feed. I mentioned Skippy earlier on, well now it’s time to name check Scooby Doo and that opening scene as the bats take off or throw in the Adams Family as well to the mix and you get the sort of idea. These mammals have a wing span of over a metre and could poo from a great height, all over the hire car which was white but soon had fruit stains all down it over the roof and windows. 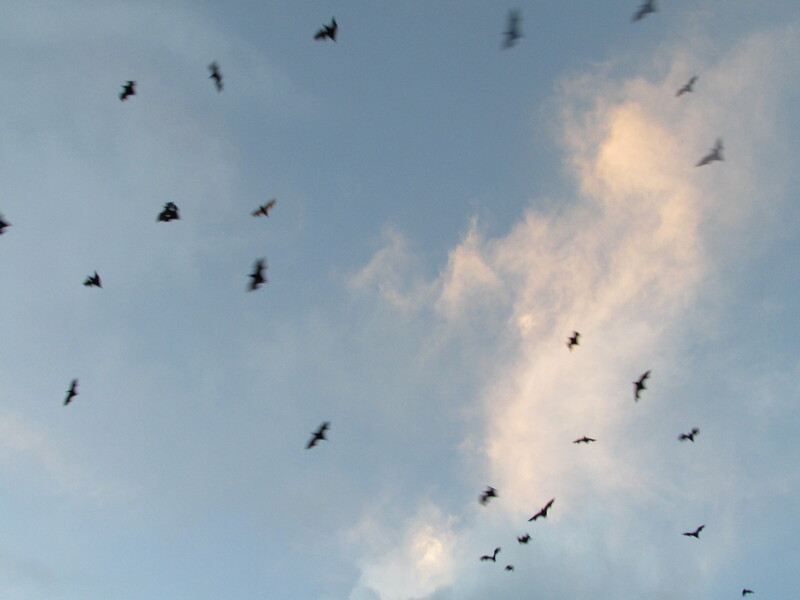 Unlike certain nationalities I could name, the bats took off in sequence, with each group joining the back of the queue before heading off in the fading light towards the distant hills. I tried to get some good shots, but sadly the ones below are the best that I could do. 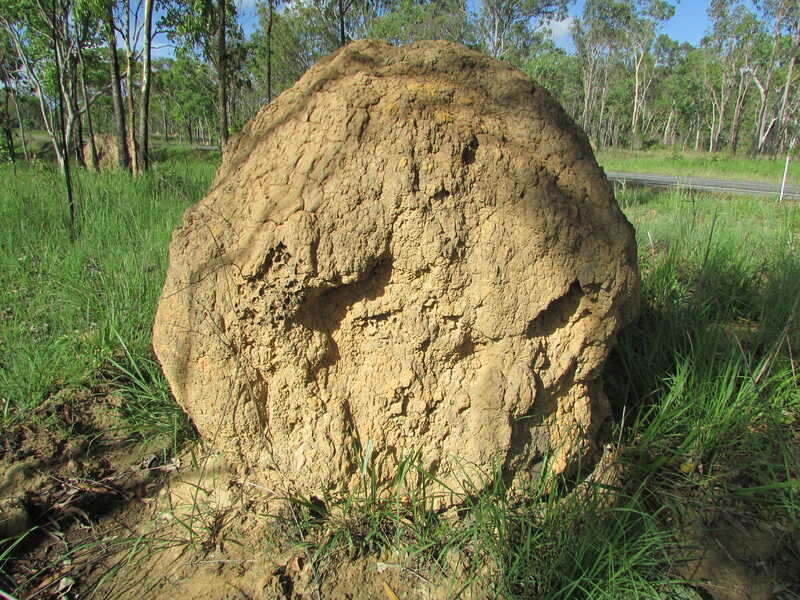 I had better luck as I managed to photograph giant termite mounds as we headed down from Cape Tribulation, through Port Douglas and Cairns, into the area called the Tablelands. There, ok now….. stiff Yorkshire upper lip now NOT trembling anymore. 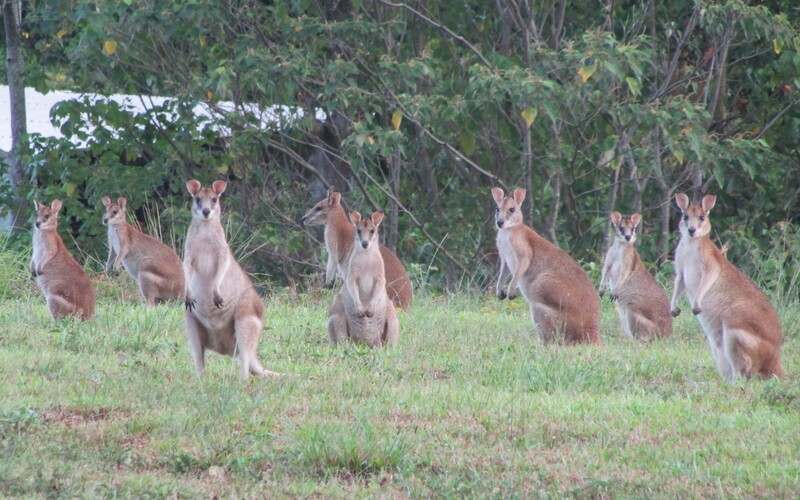 Yes, we’ve seen some stuff during our 2,200 miles on the road “down-under”. 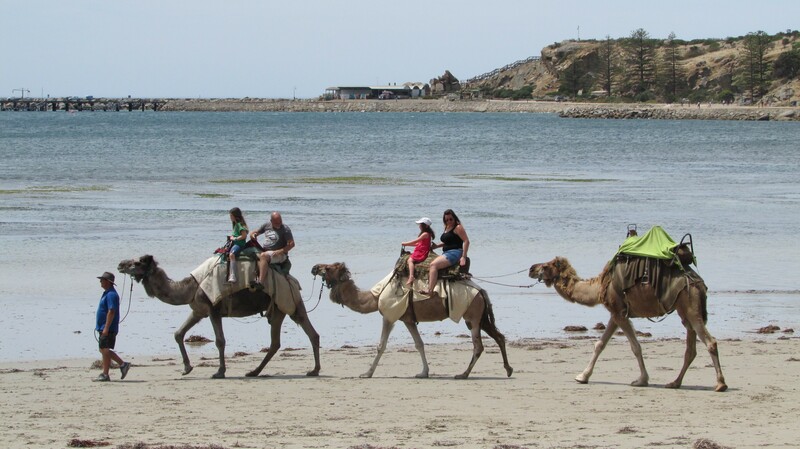 Other sights have reminded us of the UK, but then you drive a bit further and randomly see people riding camels. I say randomly, but camels are not as random in Australia as you think. Introduced in the 1840s by the British and the Afghans, there are now approximately 1.2 million feral camels and their numbers are thought to be doubling every 8-9 years. They are beginning to become a real problem despite a culling and exporting drive of some 160,000 in recent years. We could have done with a couple of camels as the road “ran out” into a dirt track a few miles north of Cape Tribulation. 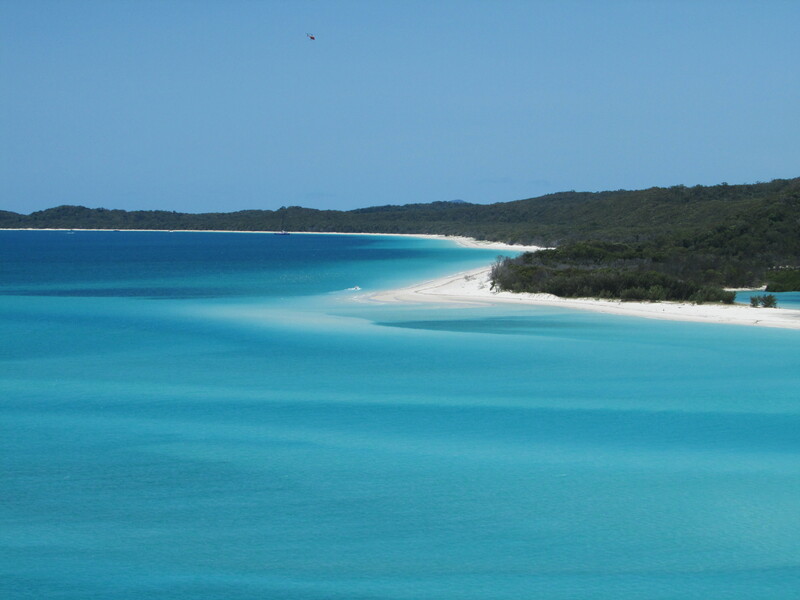 No way were we going to be able to travel 120 kms further north to Cooktown without a 4WD. Instead we turned around and bingo, saw just what we had been hunting for. A few weeks ago in Kuala Lumpur we had been amazed to see the Cassowary, a large EMU type bird which was about 1.5 high with lovely blue, red and black plumage. 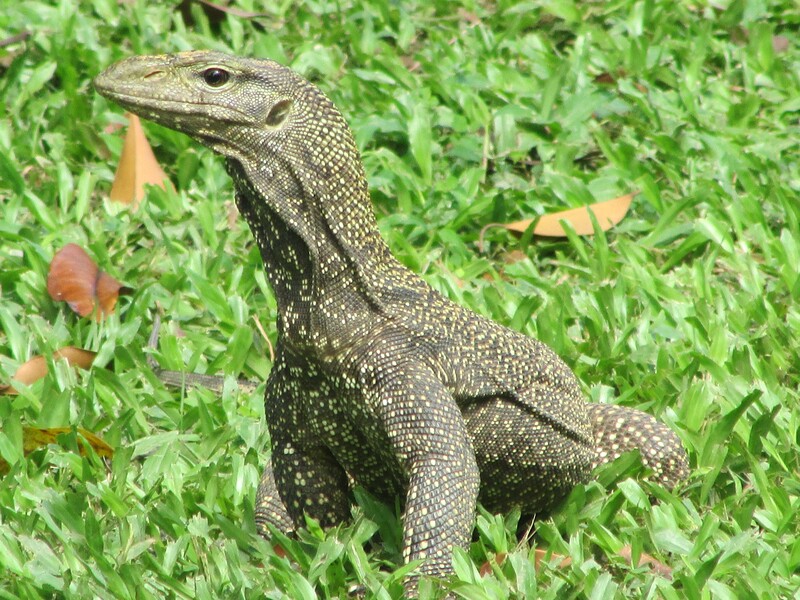 They are very rare and a lot of locals we had spoken to here have never seen them. 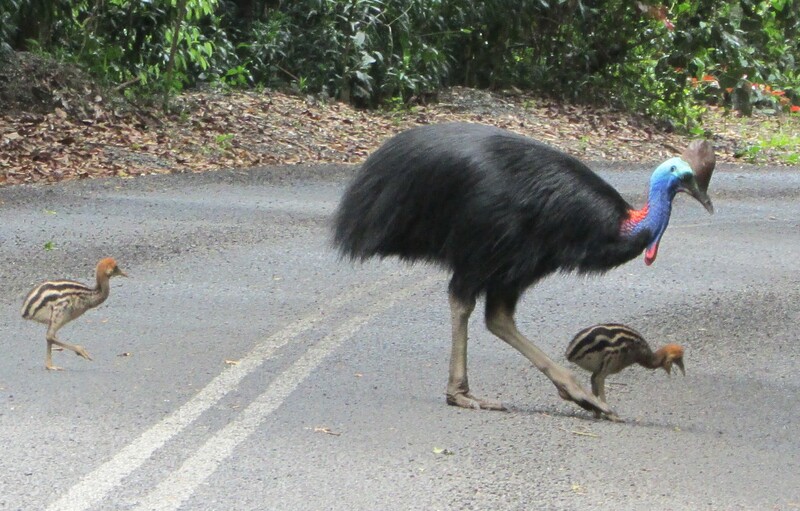 But as we rounded a corner, driving carefully at 50kph (because of yellow Cassowary signs), there was a male bird and his two chicks. Now the observant amongst you will have read “male”, perhaps thinking I missed out the two letters FE. Well no, I am right. The lady bird gives birth and when the chicks are hatched it is the Dad, yes the Dad that looks after his offspring for the next 14 months before they become “adult birds”. 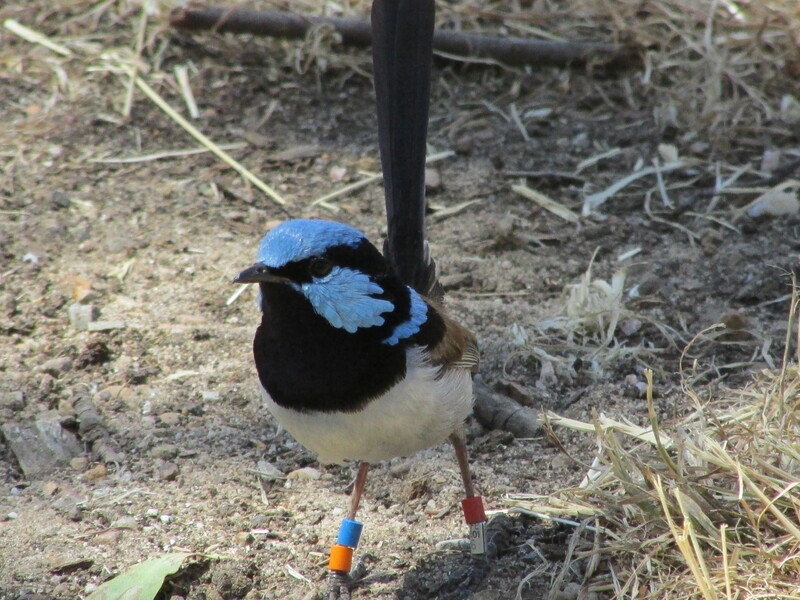 I was very impressed with this male bird – it reminded me of bringing up Joe in the same diligent way 23 years ago… or maybe not (Editor, Sarah). I took a few pictures of this amazing sight and then stopped dead in my tracks. I realised that I had parked on a blind corner and there was a large pick up van coming up behind us his Bull Bars suddenly filling my review mirror. I flagged him down just in the nick of time and the Cassowary did a runner. But we saw one – YES!!! That road had many surprises. It’s not every day that you have the chance to drive on a road through the middle of a rainforest! 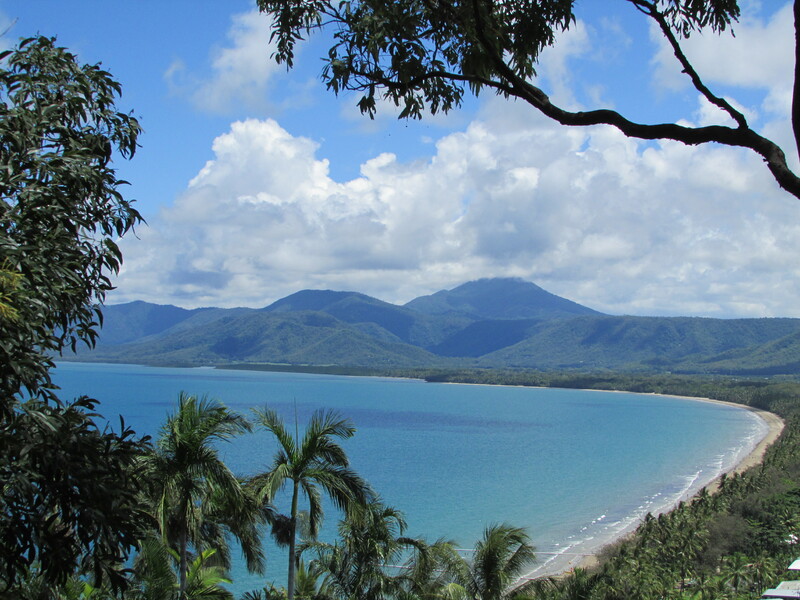 The Daintree River Valley as it is known is where the rainforest grows right down to the World Heritage listed Great Barrier Reef – the only place in the world where you can experience two World Heritage listed areas meeting. 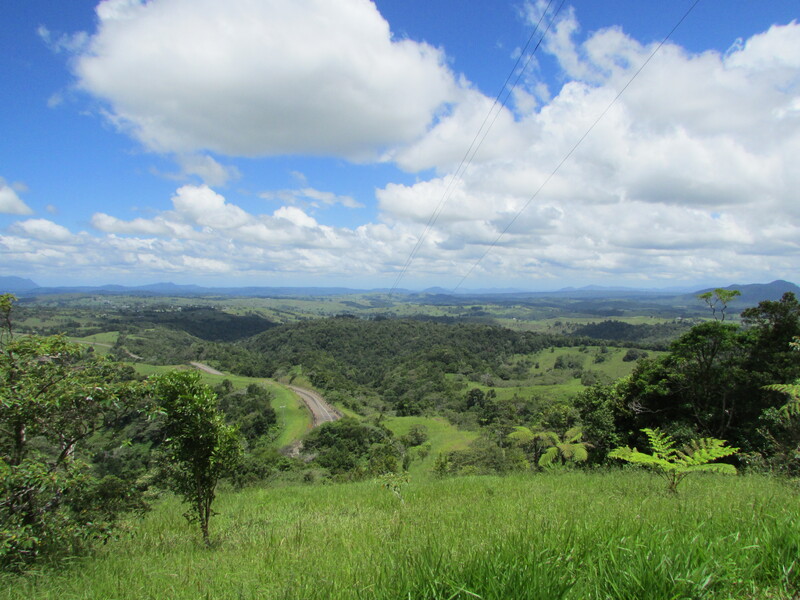 We stopped at the Discovery Centre and discovered (funny that) that the wet tropics of Queensland are THE oldest rainforests in the world some 6 to 10 times older than the oldest parks of the Amazon. Champing at the bit, we decided to go walk-about as it was like a scene from Jurassic Park. You half expected to see a dinosaur as we walked amongst an ecosystem that had been there for over 150 million years. It was stunning. Fast-flowing rivers, deep gorges, numerous waterfalls, hills in the distance and the chance to walk high in the tree canopy at a specially created look-out point 100ft off the forest floor. We got a good distance into the jungle, sweat dripping through near 100% humidity. 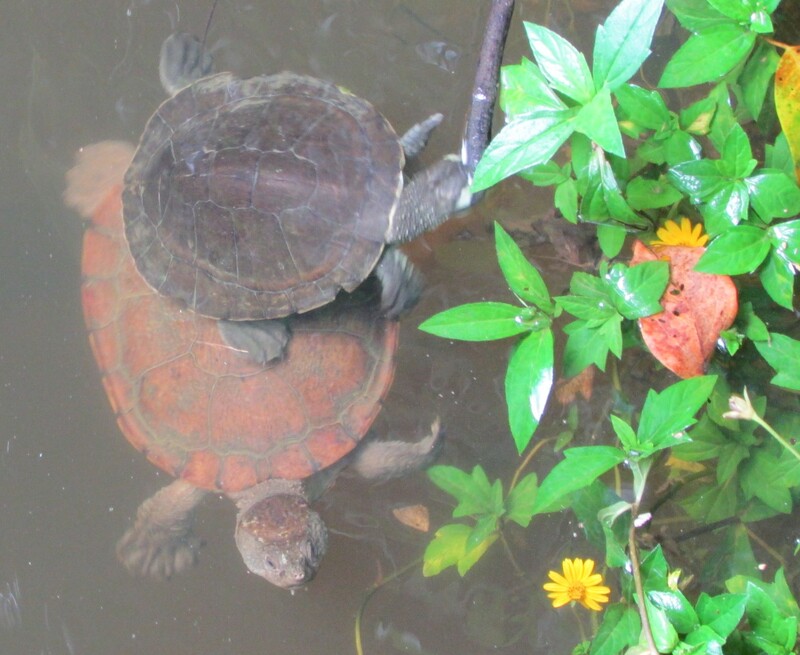 Baby turtles in small pools said hello and more giant lizards, scuttled off in search of cover. 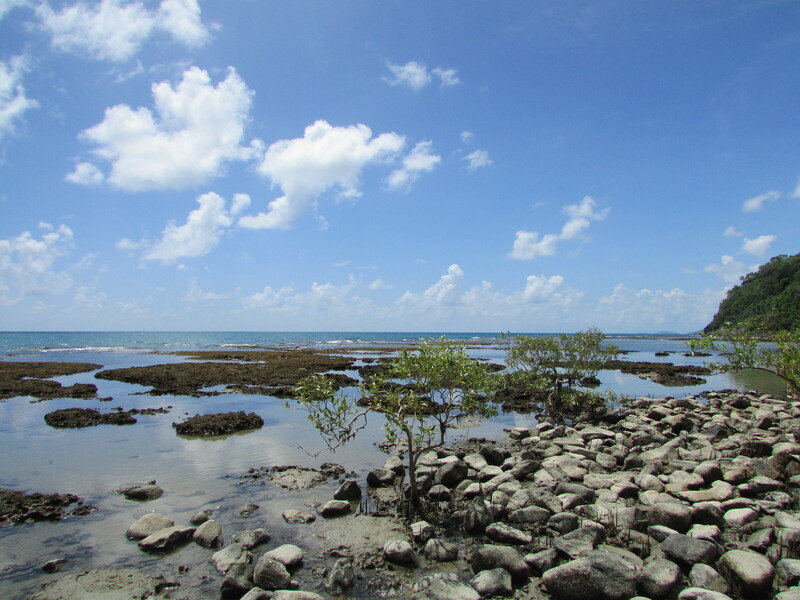 But the forest was too dense to walk right down to the Barrier Reef Coast, so back in our Hyundai Hire car we travelled a few miles coastal bound and got out once more. We were greeted by fantastic trees, shrubs, vines and palms. Johnny Weissmuller (Tarzan) would have been at home. 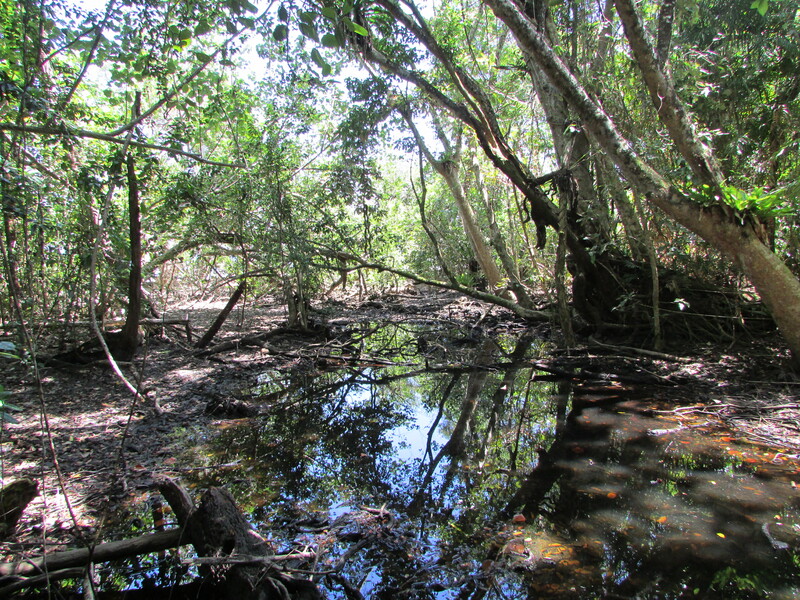 Rounding a bend on the trail we noticed a change in vegetation as the jungle gave way to mangrove swamps and signs warning us of crocodiles. We were all alone, miles from anywhere and somewhat apprehensive, particularly as these crocs’ could read German. Pushing on, fifteen minutes later we made it to the beach. No-one there – result! 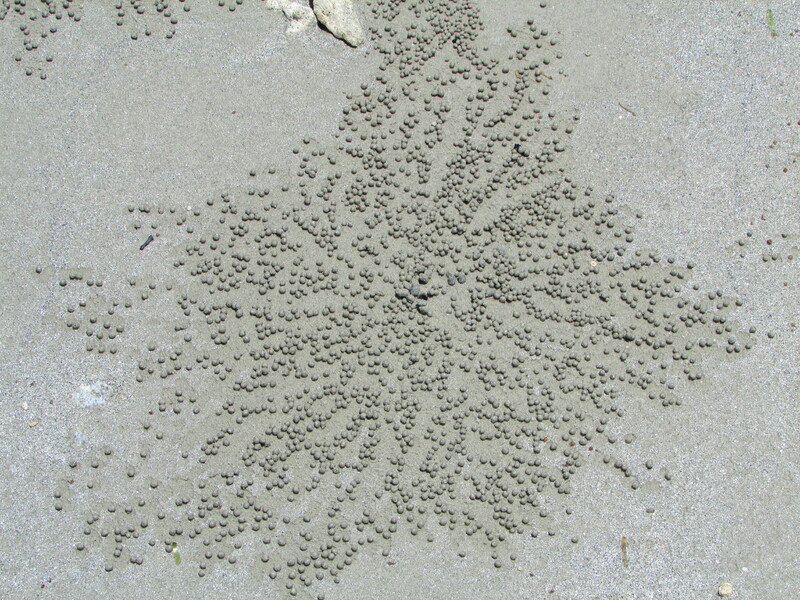 Well not quite, we were joined by thousands of small crabs who made beautiful patterns in the sand as they buried themselves in search of food and shelter. 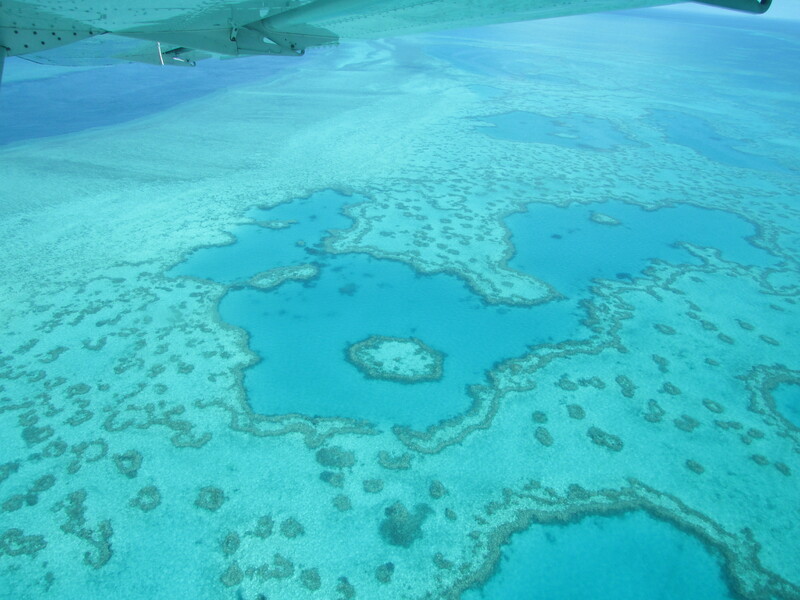 The coastline was quite superb – you can see from the photos – but nothing in comparison to our three offshore Barrier Reef expeditions…. 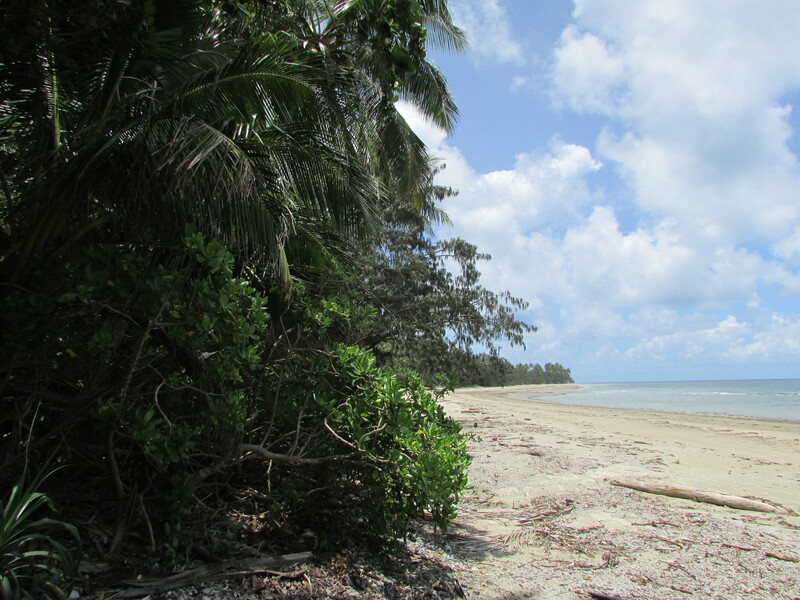 The first adventure (as previously blogged) was just off Port Douglas, 12 of us on a beautiful catamaran heading for the Low Islands, two dots in the National Park. This was simply amazing for Sarah who for the first time in her life was able to snorkel because the boat operator had prescription goggles. I’ll never forget being able to share this experience as we swam with giant turtles, dolphins and Reef Sharks that were just a few metres away. The coral was alive, undamaged and unbelievably beautiful. A few days later after more walking in the Mission Beach area, we arrived at Airlie Beach next to the Whitsunday Islands. Sarah had talked so passionately about this area having been here 35 years before when she bought a car with a friend and travelled from Sydney to Cairns. 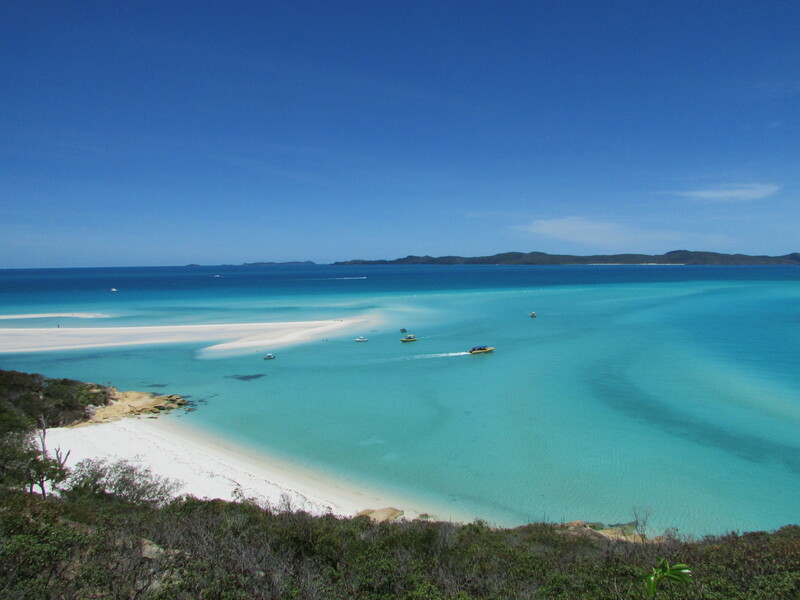 I wasn’t sure what all the fuss was about until we caught a rib boat and sped off at 35 knots towards Whitehaven Beach. 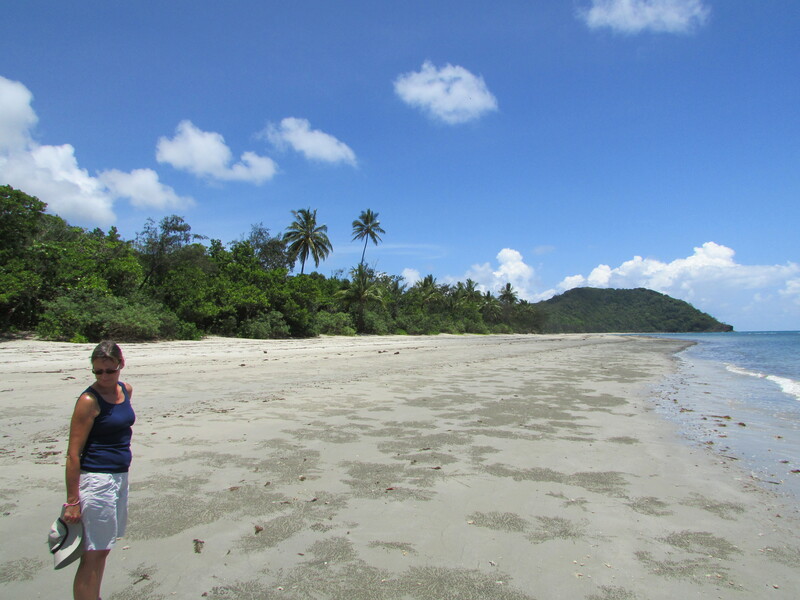 OMG it was beautiful and there were only 20 of us on a white silica sand beach which stretched for 5 miles. 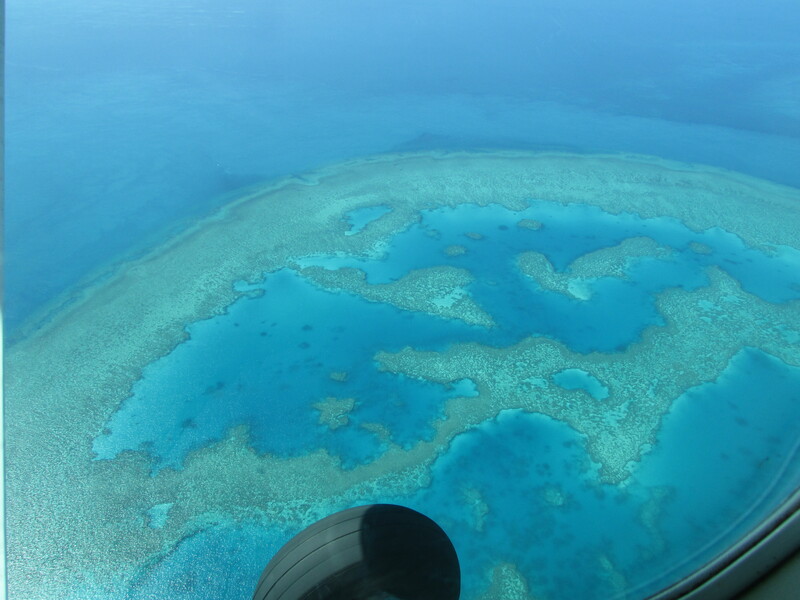 As a pre-birthday treat for Sarah, we decided to fly over the outer barrier reef. 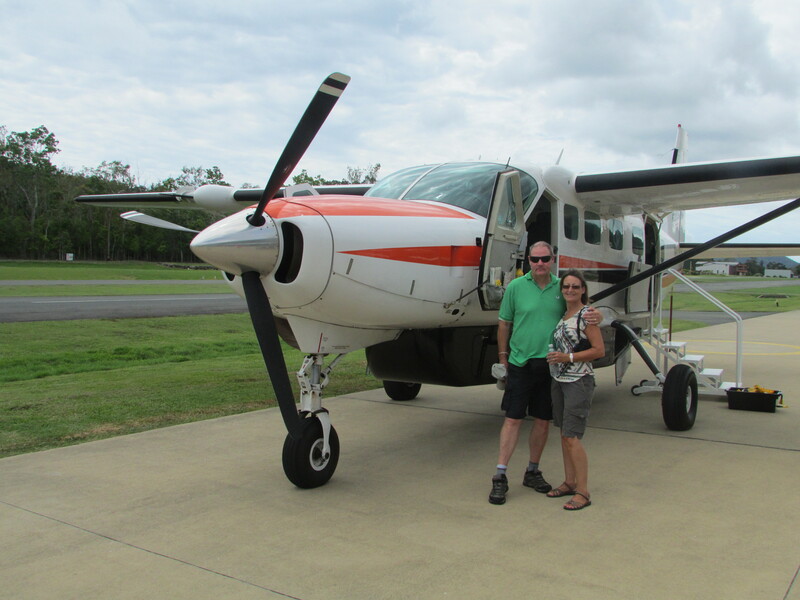 Sadly the sea plane was fully booked, but a small 14 seater Cessna 208 “Caravan” was just as good, flying 55 miles out to stunning coral reefs which we had only dreamt about and seen on David Attenborough’s documentaries. Greens and blues and turquoises contrasted with the reef. 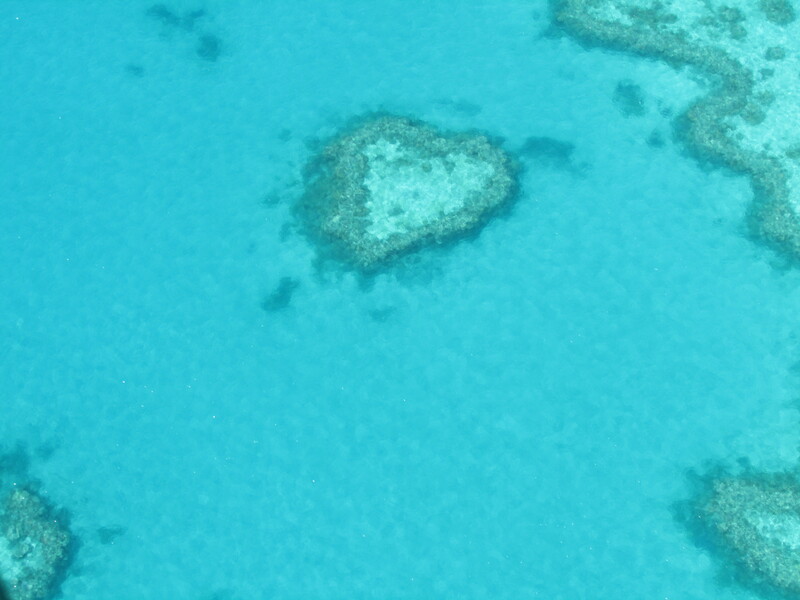 The outline of huge black Manta Rays could clearly be seen as the plane flew at just 500ft above the translucent waters. I really can’t put it all in to words, forgive me – but hopefully the pictures and captions will give you an idea. Big shout out to Bruce and Shirley at the fantastic Kipara Tropical Rainforest Retreat for all their help in booking of these once in a life time experiences. Talking of which, do check these guys out if you are ever in the area, you won’t be disappointed. 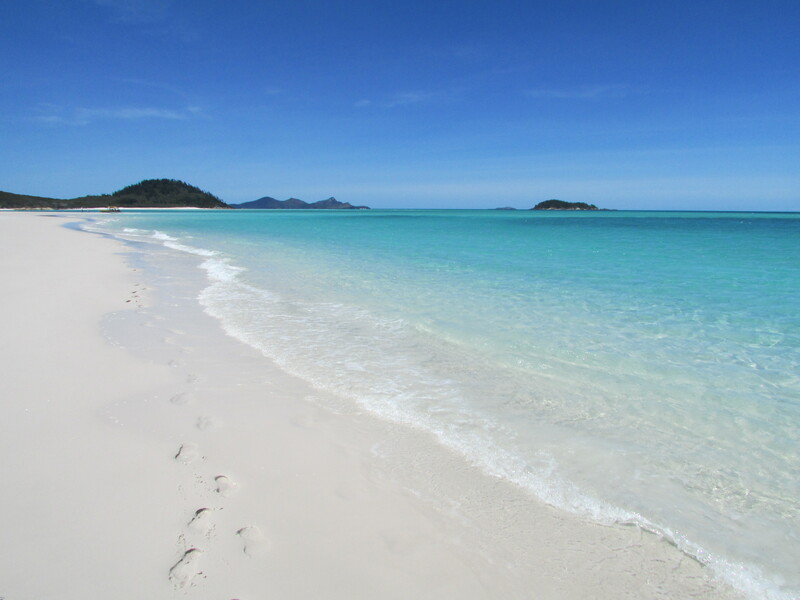 So as we head further south on our journey down the Barrier Reef to Brisbane we leave with a lifetime of memories, a seachange in our views about All Creatures Great and Small and only our footprints left in the sand. Happy Birthday Sarah – thanks for having the courage to do this trip of a lifetime.